Effect: One of the most novel vanishes of a silk or bill ever created. Performer shows a small metal tube and inserts a silk handkerchief or borrowed dollar bill into it. Suddenly, the tube disintegrates and falls onto the table as loose rings! The silk or bill has vanished. Your hands are seen to be empty. This makes a stunning vanish of a silk if you sprinkle confetti over the tube, then let the loose rings and confetti cascade onto your table top. At the end everything can be examined. The spectators will have no clue as to how the rings were just a solid tube a few moments before. Easily made from a piece of 1" metal pipe available in most hardware stores. You can make the tube from brass, stainless steel or aluminum. This is an old effect that Devin first released more than ten years and sold out completely in thirty days. It has been long discontinued and highly sought after. This is something today's audiences have not seen. Directions include a sucker effect and a presentation using a pocket laser pointer, where you apparently slice the metal tube into pieces using a laser. Talk about a unique effect! Two bonus effects included. A spectator cuts a deck and adds the value of the two cards. The silk is vanished and the loose rings are counted. The number of rings is the same number as the value of the cards. In another effect, a spectator decides upon a number and writes it on a slip of paper. 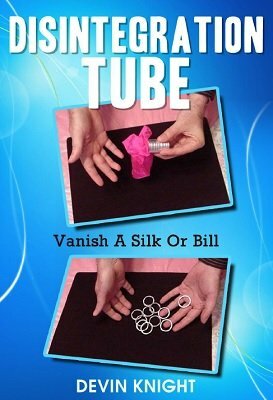 The paper is put into the tube; the paper vanishes as the tube turns into loose rings. The amazing climax is that the loose rings match the number written on the paper. You can easily make this stunning effect with these directions. If you have a miter saw and are handy you can easily gimmick the tube in a few minutes. If not, then take the tube to a local machine shop and they can gimmick it for you in a few minutes for just a few dollars.